Brighton midfielder Alan Navarro could make his return to the first team at the end of the month. The 29-year-old ruptured his cruciate ligament during the Seagulls' Carling Cup defeat by Northampton in August and has not featured since. 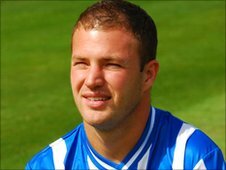 Assistant manager Mauricio Taricco told BBC Sussex: "He's training really hard and coming in strong. "He'll be like a new signing. I looked at him running the other day and he's looking in good shape." He added: "Hopefully at the end of this month he will be joining us."